RAW GM chimes in. He says Orton will face Punk at WM. Orton will face Nexus members in the following weeks. Whoever doesnt win for Nexus will be banned from being in Punks corner at WrestleMania. Havn't seen swager in a wile. Orton is gonna win this, there aint no way he wont. 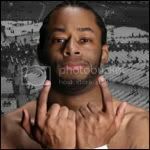 I can't wait til he punts Otunga! Orton wins, starts acting like he's going to punt McGillicutty. Punk says no, Orton punts him anyway. Rest of Nexus runs down and Orton takes off into the crowd. Cena will face A-Ri tonight. If Cena wins, A-Ri is fired. If Cena loses, he must say that the Miz is awesome. To make sure Miz doesnt interfere, it will be a Steel Cage match. There is some sort of divas battle royal going on. I honestly wasnt paying attention to it. Im sorry but i cant continue with this discussion. I'm having so much trouble keeping my eyes open. If someone could take over, it'd be much appreciated. Again, im sorry.